Liposuction is the second most popular plastic surgery in the U.S., and has been for many years. This cosmetic procedure is an effective fat removal method that has helped millions of men and women achieve their ideal body contour for decades. Our board-certified plastic surgeon performs lipo thousands of times each year and incorporates liposuction into other plastic surgeries such as a tummy tuck to transform your entire torso. If you struggle with stubborn areas of fat, please contact Advanced Cosmetic Surgery in Overland Park today at 913-341-2188 to see if liposuction is right for you. Dr. Levi Young offers free consultations to discuss your goals and which procedures can help you reach them. We serve clients throughout the Kansas City, Kansas area. How Much Fat Can Be Removed with Lipo? Why Choose Our Liposuction Surgeon? Liposuction is known by many names: lipo, lipoplasty, liposculpture suction, and lipectomy. It’s a fat removal surgery typically done under general anesthesia that removes fat deposit from various areas of your body (hips, thighs, abdomen, buttocks). This cosmetic procedure is not a solution to obesity and can’t address skin laxity, stretch marks, dimples, or cellulite. Men and women interested in liposuction need to be at a stable weight that’s at or near their goal. Advanced Cosmetic Surgery offers tumescent liposuction which provides a contoured figure. Lipo is best for men and women who’ve tried diet and exercise but still have residual fat in stubborn areas where lifestyle changes didn’t help such as the hips and love handles. 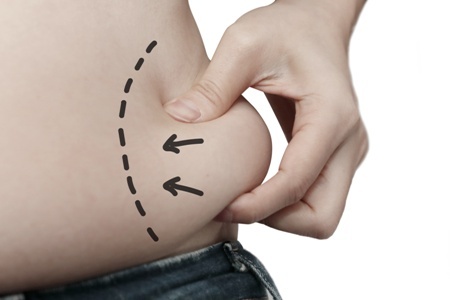 Fat cells change in size as you gain and lose weight, and liposuction removes the fat cells altogether. However, you can still add weight to other areas which can make your figure seem disproportionate, so it’s important to maintain a healthy lifestyle to enjoy your results. Most lipo surgeries require you to go under general anesthesia, which means you’ll be unconscious during the procedure. Liposuction performed on smaller areas may only need local anesthetic so you can stay awake during surgery. A cannula (tiny, hollow tube) is used to suction out the fat, or multiple “microcannulas” may be used. Tumescent liposuction involves a mixture of saline (salt water), lidocaine (local anesthetic), and epinephrine, which is pumped into your body under your skin in the area where fat is to be removed. That solution targets the fat cells and causes them to swell and firm up. The tumescent method reduces or eliminates the need for general anesthesia or sedation. The combination of saline and medication leads to less bleeding during and after liposuction surgery as well as reduced bruising. There are other liposuction techniques such as power-assisted liposuction, but the results of the procedure are the same. This cosmetic surgery is occasionally performed for medical concerns such as gynecomastia or after extreme weight loss. Gynecomastia is enlarged male breasts which can arise for a variety of reasons ranging from genetics, taking certain medications, and obesity. Other medical issues that can be treated with lipo include lymphedema, lipodystrophy, and lipomas. The more fat removed during liposuction, the higher the risk of complications. Most men and women think of how many pounds are removed, but scientifically, the amount is measured in liters or cubic centimeters (cc). The amount of fat deposits that can be safely taken out during surgery depends on the current weight of the patient, but the accepted maximum amount for a one-time procedure seems to be five liters or 5,000 cc, which is approximately 10-11 pounds. Most plastic surgeons limit it to 6-8 pounds at once. If you have more than ten pounds to remove via lipo, you may need multiple procedures to reach your ideal weight safely, but we may also suggest trying to lose some of those pounds through diet and exercise first to avoid multiple surgeries. Liposuction has one goal: to get rid of unwanted fat. A tummy tuck accomplishes several goals at once including fat removal, abdominal muscle tightening, and excising loose skin tissue. Many of our patients come in to see Dr. Young convinced that lipo is the best option for them, but don’t realize liposuction could leave them with loose skin. Dr. Young considers the whole picture, which is why your initial consultation is so important to the process. You may need one or more cosmetic procedures to reach your ideal look. If you want to get rid of minimal amounts of unwanted fat and have taut, youthful skin, liposuction is likely the right course of action. If you have both unwanted fat and loose skin from weight loss or pregnancy, a tummy tuck could offer the best results. Dr. Young utilizes liposuction extensively during the tummy tuck surgery, which means you get the benefits of both procedures and ensures you’re happy with the outcome. There are other cosmetic surgeries such as the lower body lift or mommy makeover that work well in conjunction with liposuction. In many cases, liposuction combined with another procedure is the best way sculpt your figure. You’re in good health, without medical problems or conditions that could complicate the liposuction procedure such as heart disease and diabetes or a history of blood clots. Dr. Young will ask for your medical history and discuss any medications, vitamins, or habits (such as smoking) that could cause complications during and after your liposuction. You have one or more areas of unwanted fat that are resistant to diet and exercise. You’re at or close to your ideal weight. We suggest being within 30 percent or less than 20 pounds away from your goal. You’re prepared to maintain or have maintained a stable weight. Gaining or losing weight following liposuction can affect your results. The fat cells are gone for good, but you can gain weight in other areas, causing your figure to look disproportionate. You have firm skin and muscle tone, which will make sure you don’t have loose skin following fat removal. You’re prepared for the time required and steps necessary to fully recover following liposuction. Liposuction is an invasive cosmetic surgery, and as with any procedure, there are risks for complications. One of the concerns we hear from patients is about contour abnormalities. Body contouring is the sole purpose of this surgery, and therefore, our plastic surgeon’s job to make sure your sculpted figure looks proportionate. Dr. Young’s eye for artistry helps him accomplish beautiful contours for our lipo patients because he’s taking your entire body shape into consideration. While contour abnormality is always a possibility, it is a rare one. Another concern our patients have is getting rid of cellulite, and unfortunately, liposuction can do little to nothing to address this dimpling of the skin. Cellulite lives within the superficial layers of your skin, and liposuction is performed below that. Liposuction is guaranteed to improve the contour of your body by removing fat, but cellulite, stretch marks, and other imperfections near the skin won’t be addressed. Dr. Young will walk you through the before, during, and after aspects of the liposuction procedure to make sure you’re prepared for the recovery period. The extent of your recovery will depend on how much fat was removed and from which part of your body. You’ll experience varying levels of discomfort, which can typically be treated with over-the-counter medications. Dr. Young may prescribe additional pain medications to aid in your recovery. You’ll need at least one week off from work and must wear compression garments to reduce residual swelling for 4-6 weeks depending on the treated body area. You’ll come back to Advanced Cosmetic Surgery for several follow-up visits including one week, six weeks, six months, and one year after your surgery. You won’t see the full results of your liposuction surgery for several months as your body heals and becomes accustomed to the new dimensions. Advanced Cosmetic Surgery believes in individualized care and patient education. You’re not just a number to Dr. Young. While he’s performed thousands of liposuction procedures, each patient has specific goals for their body and the surgical outcome. Dr. Young listens to you to make sure you have the right surgery to reach your ideal body contour. His attention to detail, artistic ability, surgical skill, and years of experience gives you the advantage of a customized cosmetic plan to achieve a stunning figure. If you’re interested in liposuction, please contact Dr. Young in Overland Park, Kansas today at 913-341-2188 to schedule your free consultation. Advanced Cosmetic Surgery serves clients in Overland Park and the greater Kansas City area.